Every Second Saturday of Each Month. 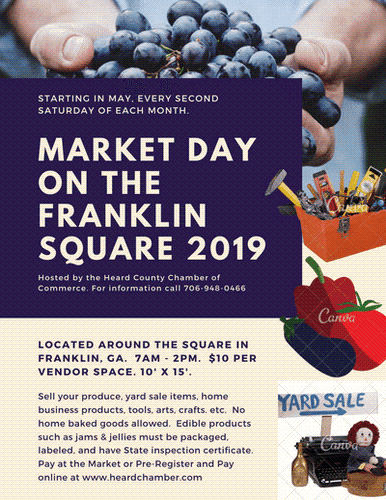 The Heard County Chamber of Commerce will host Market Day on the Franklin Square. Located around the square in Franklin, GA. Sell your produce, yard sale items, home business products, tools, arts, crafts, etc. No home baked goods allowed. Edible products such as jams, jellies must be packaged and labeled and have State inspection certificate. Call the Chamber office at 706-948-0466. Vendor Spaces are 10' x 15'. Each vendor space is $10. Registration is available online to secure your spot.